A maximum of 4 lines of engraving allowed. Select a wood easel to personalize your loved one's urn. 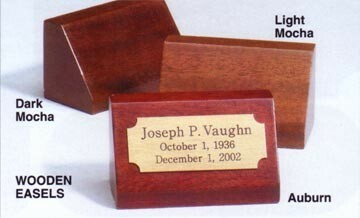 Available in 3 wood types, these easels are designed to be placed in front of any urn. Please allow 24-48 hours for engraving and to ship out. Also easel may ship separately from urn if ordering together.